Flunssaiset terveiset, meillä koko perhe on sairastanut enemmän ja vähemmän jo pari viikkoa. Perjantain kesäparisarja jatkuu kuitenkin. Kuluu niitä nenäliinoja häissäkin! Hello, all of our family have been in flu for two weeks and some other family issues too. But here's my Friday Couples again! pearly cardstocks, no designer papers. A beautifully designed wedding card Mervi. Lots of rain here as well. 'Thank you for joining the challenge at ODBD! Your card is beautiful and elegant! Great Wedding card! What a beautiful wedding card, Mervi!! I just love the verse in the heart and the beautiful design!! The recipient will love it! Thanks for joining us at ODBD!! 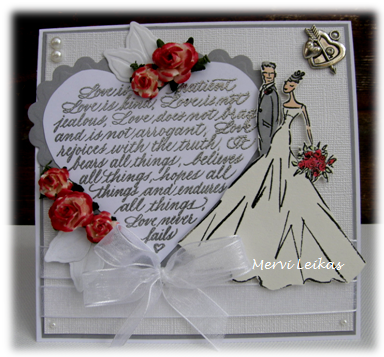 Gorgeous, beautiful Wedding card Mervi. I really like how you designed this with the heart with sentiment and the bride and groom beside it, very elegant and lovely. Lovely card - great colouring. thanks for joining the challenge at I Love Promarkers. Good luck. Your card is absolutely beautiful, Mervi. I saw it on ODBD and I wanted to stop by to take a closer look and to let you know how much I like it. SUPER pretty! 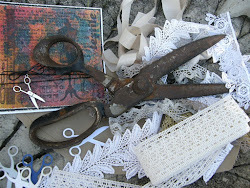 I would love to have you share your wonderful creations with us at Word Art Wednesday. Your cards would fit right in, and it would lovely to have you play along with us! Love that Penny Black stamp! What a super wedding card! Thanks for sharing with Create and Inspire!